The partly freestanding canopy helps with hunger pains. Twinfix has completed one of its largest and most unusual canopy installations to help protect a multitude of hungry schoolchildren from the elements. 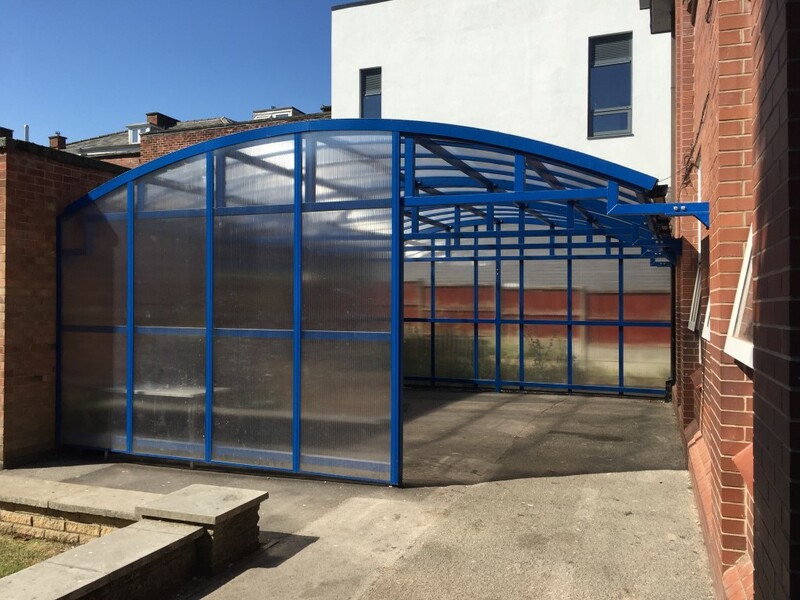 The 6.2m x 7.8m partly freestanding canopy has been erected between two buildings at the former independent North Cestrian Grammar School in Altrincham, Cheshire, which has been attracting a plethora of pupils since it became an academy in 2016. To meet the needs of the additional 80 students per year, the school has invested in new design and technology and science and food technology suites as well as a complete refurbishment of all of its classrooms and a new dining room that will be twice the size of the existing canteen. 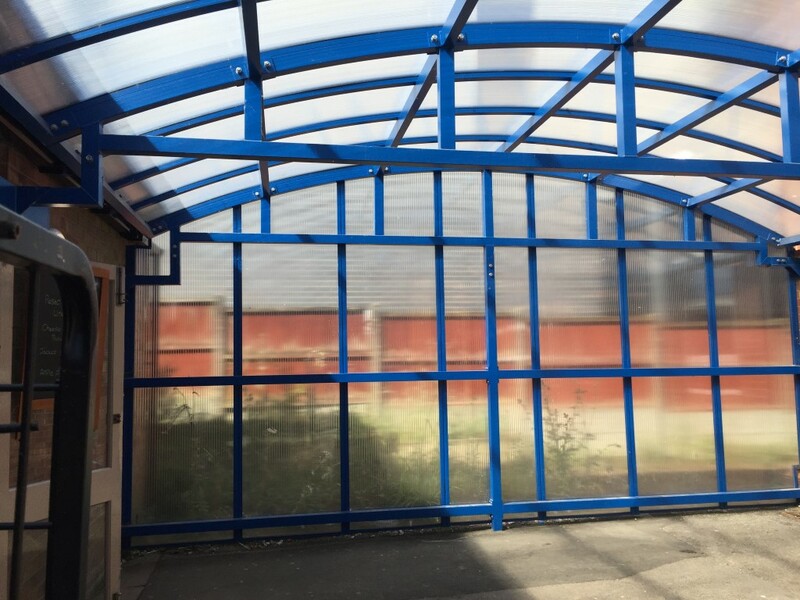 The clear Twinfix canopy was required to provide a “cost-effective” shelter for the students as they wait in the lunch queues outside the canteen. 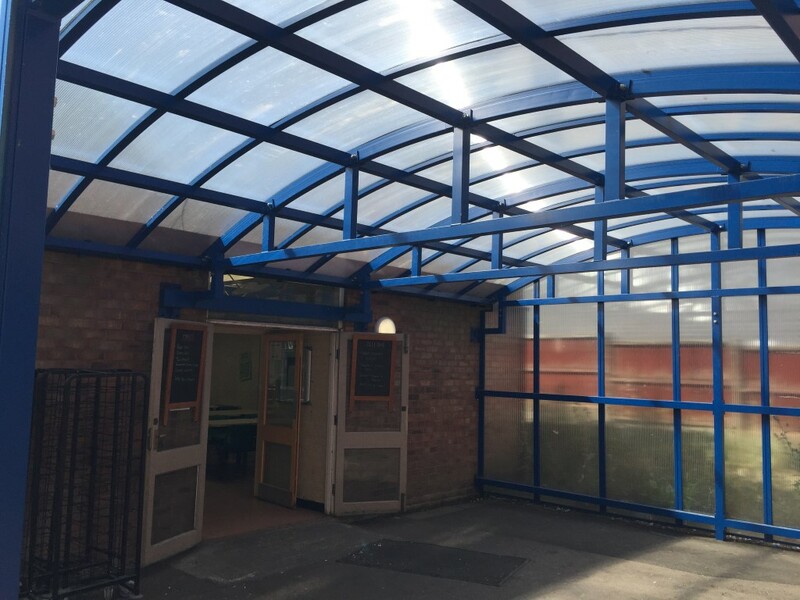 It is unusual in that it comprises vertical gable ends of 16mm triple-wall polycarbonate as well as the 10mm twin-wall non-fragile polycarbonate roof which is curved to a 6.9m radius. The gable ends were assembled in the Twinfix factory and the roof on-site. 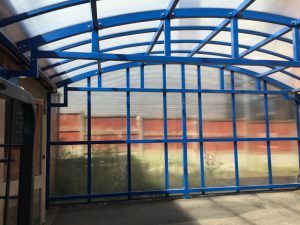 The roof comprises 11 panels 68mm wide and 6.3m long which are clamped between two-part 60mm glazing bars while the gable ends use 88mm wide and up to 3.2m high panels slid into single-part 70mm bars. 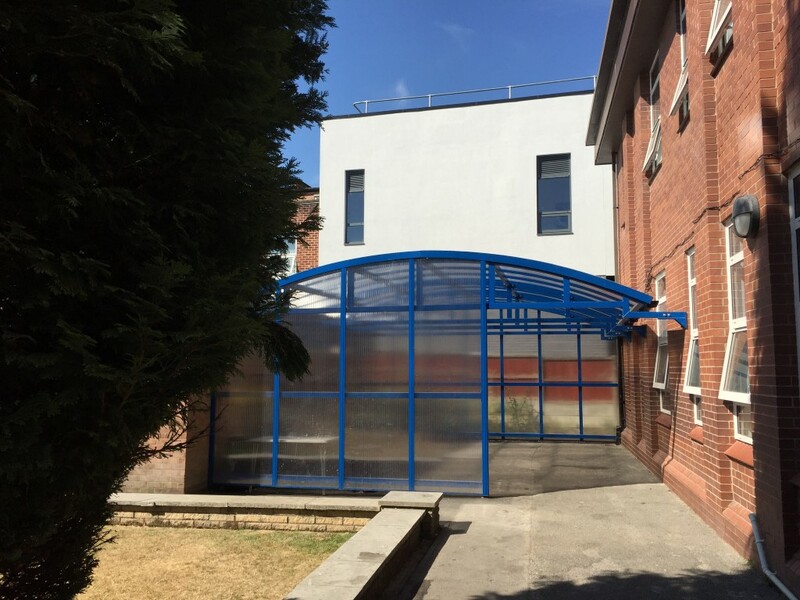 The matt blue (RAL 5010) polyester powder coated aluminium frame with black PVC gutters is fixed to the two buildings via wall-mounted square posts, with one gable end open for 2.2m as an entrance. 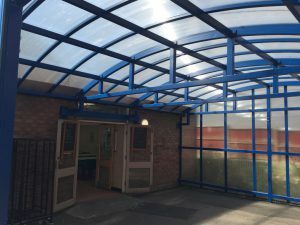 North Cestrian headmaster Lee Bergin said the Twinfix canopy was specified by their bursar. “I suspect the main reason was cost but also the lead time was the shortest of three companies. 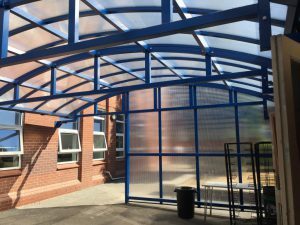 It has proven to be robust enough to deal with daily queues of hungry children and the colour matches the school blue,” he said. 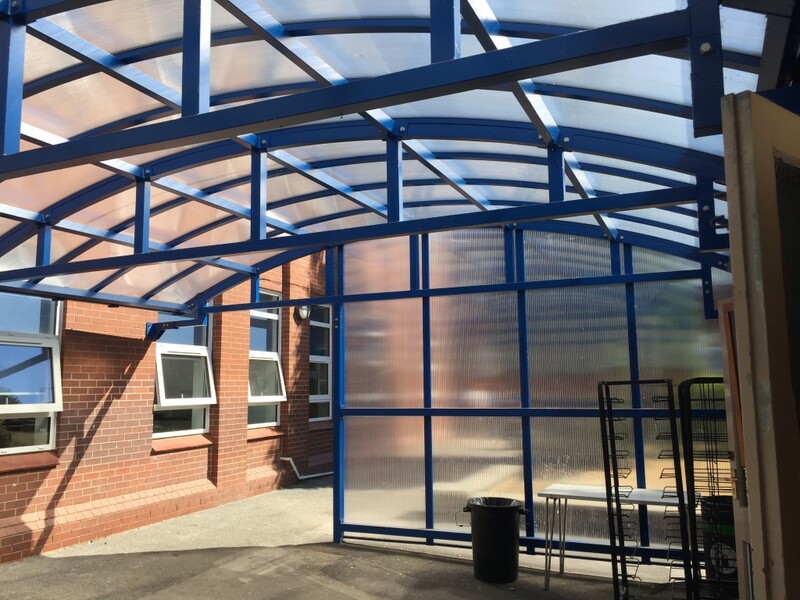 After the canteen is converted to new music rooms the canopy will continue to provide useful outside space. North Cestrian was one of 49 schools in 2016 to be approved by the Department of Education to become a non-selective, non-fee-paying academy through the Government’s Free School programme. This means it can still set its own extended curriculum, term dates and length of school day. Its governing body oversees and operates the school but pupils do not have to sit an entrance exam.